I have listed a new property at 3697 15TH AVE W in Vancouver. VIEW! VIEW! VIEW! Great big views of the water, mountains and downtown city skyline. Perfect Point Grey corner property on a quiet street with large side boulevard. There are many design possibilities to take advantage of the site andmaximize the function and outlook of your new home. The house is charming with 3 bedrooms and a 3 piece bath on the top floor. The main floor has the living, dining, kitchen, bedroom and downstairs is a recroom laundry and a 5th bedroom. Currently rented mos/mos for $3400 to terrific tenants who would love to stay. Build your dream house. Hold for the future. Renovate and move in. Queen Elizabeth, Lord Byng catchments, close to the best private schools and UBC. Premiere Westside YOU'LL LOVE IT! I have listed a new property at 1335 - 1337 WALNUT ST in Vancouver. KIT'S POINT! 4 LEGAL UNITS revenue property on a non-through tree lined street in one of the City's most desirable neighborhoods. West facing backyard, 33x100.5 RT-9 lot. Renovate and take advantage of the size of this 3075 square foot 1912 house as a four unit revenue property, your own residence with income, or convert to a single family home. Walking distance to the beaches, shopping, restaurants, parks and all the area has to offer. Never a vacancy, this location rents easily and at a premium. Currently there is a top floor two bedroom, a main floor two bedroom and two 1 bedroom garden level suites. Five Electric Meters and the tenants pay their own heat. 2015Assessed value $2,200,000 Great opportunity to own a piece of Vancouver that pays YOU! every month. Contact LS for information package. YOU'LL LOVE IT. I have sold a property at 1104 2165 40TH AVE W in Vancouver. On top of Kerrisdale. This Southeast facing one bedroom co-op apartment with large balcony has great views across Kerrisdale to the airport and the Gulf Islands. The concrete building has undergone a complete update including parkingmembrane, windows, exterior, balconies, roof, plumbing, elevator and boiler. A bright, open, efficient layout that wakes up to the morning sun with a warm southern outlook. Updated kitchen and bath, new flooring and paint. Walk out the front doors to a world of convenience; shopping, recreation and restaurants. Have a coffee with friends. Stroll, shop, eat, repeat. Unbeatable value for Westside living in a completely refurbished concrete tower. YOU'LL LOVE IT! VANCOUVER, B.C. – February 3, 2015 – The first month of 2015 saw home sale activity above historical norms, while the number of homes listed for sale trended below typical levels. The Real Estate Board of Greater Vancouver (REBGV) reports that residential property sales in Greater Vancouver reached 1,913 on the Multiple Listing Service® (MLS®) in January 2015. This represents an 8.7 percent increase compared to the 1,760 sales recorded in January 2014, and a 9.6 percent decline compared to the 2,116 sales in December 2014. Last month’s sales were 14.9 percent above the 10-year sales average for the month. New listings for detached, attached and apartment properties in Metro Vancouver1 totalled 4,737 in January. This represents an 11.4 percent decline compared to the 5,345 new listings reported in January 2014. Last month’s new listing count was 1.2 percent higher than the region’s 10-year new listing average for the month. The total number of properties currently listed for sale on the REBGV MLS® is 10,811, a 14.2 percent decline compared to January 2014 and a 4.8 percent increase compared to December 2014. The MLS® Home Price Index composite benchmark price for all residential properties in Metro Vancouver is currently $641,60022. This represents a 5.5 percent increase compared to January 2014. With the sales-to-active-listings ratio at 17.7 percent, the region remains in balanced market territory. Sales of detached properties in January 2015 reached 781, an increase of 7.3 percent from the 728 detached sales recorded in January 2014, and a 44.1 percent increase from the 542 units sold in January 2013. The benchmark price for a detached property in Metro Vancouver increased 8.4 percent from January 2014 to $1,010,000. Sales of apartment properties reached 809 in January 2015, an increase of 7.4 percent compared to the 753 sales in January 2014, and an increase of 40.5 percent compared to the 576 sales in January 2013. The benchmark price of an apartment property increased 2.5 percent from January 2014 to $382,800. Attached property sales in January 2015 totalled 323, an increase of 15.8 percent compared to the 279 sales in January 2014, and a 38.6 percent increase from the 233 attached properties sold in January 2013. 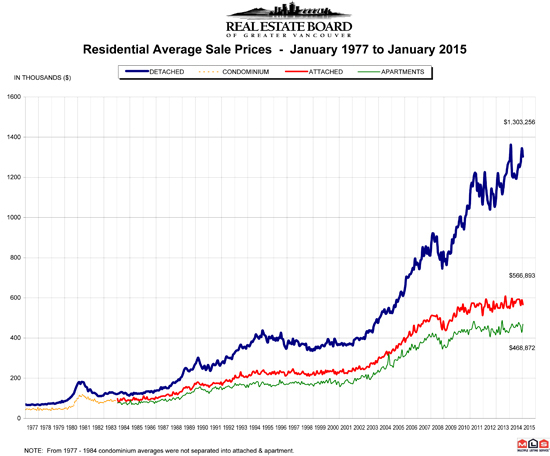 The benchmark price of an attached unit increased 4.3 percent between January 2014 and 2015 to $479,600.